FOXBORO, Mass. – With 2:32 remaining in the game, after a 12-minute touchdown drive and two-point conversion gave King Philip its first lead, Foxboro took the ball at its own 32-yard-line with one last chance to pull out a victory and improve to 2-0 on the season. It was also one last opportunity to get head coach Jack Martinelli his 250th win in a career at Foxboro that stretches back to 1982. Quarterback Mark Clagg was sacked on first down, but he stepped up to find Connor McNamara for 14 yards and a first down and then Austin Ryan for 38 yards down to the KP 15. Two plays and three yards later, Clagg threw an incomplete pass and history came down to the foot of junior John Cronin. Cronin, who had kicked a game-winning extra point as a freshman against Attleboro, seemed calm as he stood over the ball. “They were calmer than the coaches,” said Martinelli after the game. The kick was a line drive knuckleball that stayed inside the left upright to put the hosts ahead with just 20 seconds remaining. KP ran two plays but could not make a dent and the Foxboro players stormed onto the field to celebrate not only a big league victory but history for their coach. Martinelli, as expected, would not take credit for any of the success that the Foxboro program has had over the past 33 seasons. For many years, the Warriors were a dominant force in the Hockomock, winning league and Super Bowl titles. Demographics have shifted and Foxboro is one of the smaller schools in the league, but football remains a cornerstone program. On the opposite sideline, KP coach Brian Lee, who is now in his eighth year in charge, spoke of the respect he has for the coaches that have been successful in a competitive league for as long as Martinelli has. “They’ve been awesome since as long as I can remember, since I was in high school,” said Lee. Surrounded by reporters, with the band playing a few feet behind him, Martinelli was not worried about his own legacy or what it meant to reach such a milestone. “I mean…am I happy? Yeah,” he responded when asked. He remembers when it all began, 33 years ago in a game he described as being very similar to Thursday night’s. His team went out and edged Westwood on the road 14-13. More than three decades later, he is still on the sidelines, still calling out defensive assignments and still barking for calls. Two hundred and fifty is just a number but only because Jack Martinelli’s legacy at Foxboro goes well beyond wins and losses. FOXBORO, Mass. – The snap from senior Sean Smalley was on point. Senior Connor McNamara took the snap and put the football down perfectly. 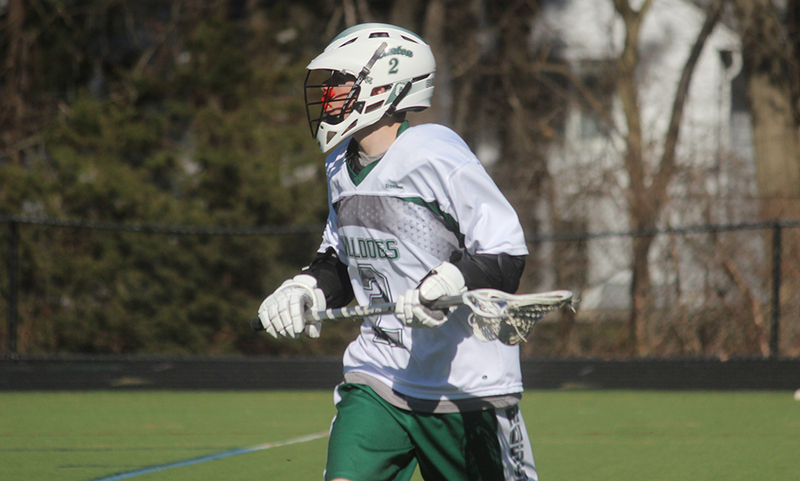 From there, junior John Cronin took three steps, planting his left leg and using his right to split the uprights for the game-winning field goal as Foxboro took down King Philip, 17-15, and deliver head coach Jack Martinelli his 250th career victory. Martinelli becomes just the 15th coach in Massachusetts high school history to reach the milestone. King Philip looked like they completed a drive that might have put an end to game, chewing up over 12 minutes of game clock and pushing in a touchdown and a two point conversion to take their first lead of the game. But with 2:24 left and starting from their own 36 yard line, Foxboro was able to move the ball down the field in just three plays and then three plays later, connected on Cronin’s field goal. A sack by Daniel Loewen on first down pushed Foxboro back but after that, junior quarterback Mark Clagg connected with Connor McNamara on a screen for 14 yards on second down. On first down from Foxboro’s own 47, Clagg hit Austin Ryan over the middle and after a juke move, Ryan went on to gain 38 yards to the KP 15-yard line. Two rushing plays and an incompletion got the clock to under 30 seconds. That’s when Cronin hit his 28-yard field goal to put Foxboro up 17-15 with 21.2 seconds left. 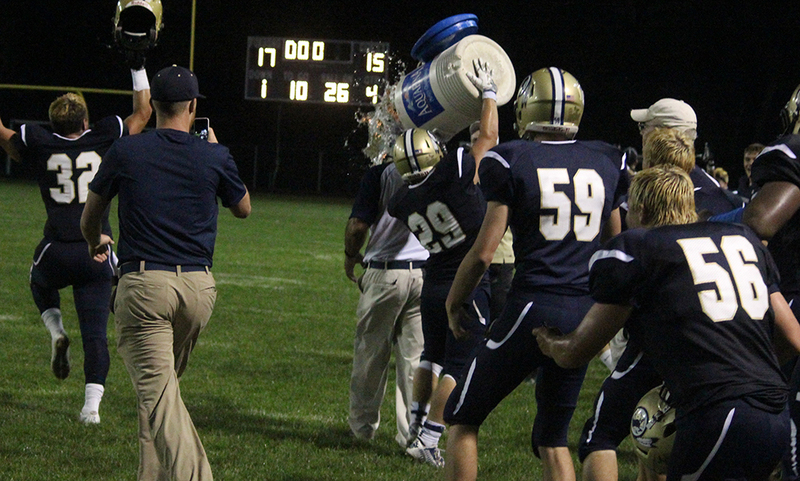 “Clagg had all the composure just like John Cronin who kicked the field goal,” Martinelli said. “With at least two timeouts to ice him, he still made it perfect. I’m so proud of him. King Philip trailed 7-0 and 14-7 in the game but it wasn’t until their second to last drive when they finally took the lead. Starting at their own 11-yard line, King Philip used 20 plays to go 89 yards to find the end zone. Junior quarterback John DeLuca did most of his work on the ground but not in the conventional way most high school signal callers do. DeLuca, working from under center, gained 31 of those yards on 10 QB sneaks, capped off by his plunge in from a yard out. Because of the success of DeLuca’s sneaks, KP head coach Brian Lee elected to go for two. Once again, DeLuca followed the blocks right up the middle set by center Daniel Loewen and guards Michael Sullivan and Billy Dittrich and converted the two-point conversion to give KP a 15-14 lead with just over two minutes to play. Foxboro took the first lead of the game on the first drive of the game. Starting at their own 25, it took just six plays before they found the end zone. On the second play, Clagg found McNamara on a short pass and he scampered down the right sideline for 61 yards all the way to the 15-yard line of King Philip. Two negative rushes and a 10-yard completion to Ryan forced Foxboro into a 4th down situation. Martinelli first sent Cronin and the field goal unit out but after a pair of timeouts – one from each side – the Warriors trotted out Clagg and the offense again. Clagg connected with McNamara on the right side again and he raced into the end zone to give Foxboro a 7-0 lead. King Philip knotted the game in the second quarter. The Warriors alternated carries from their backs and DeLuca to move the ball. First it was a pair of runs fro Sean Garrity that netted 19 yards. Two more from Gio Fernandez picked up 11 yards and then two from Garrity sent for seven yards. On third down from the one yard line, DeLuca took it form under center on the sneak and went all the way to the end zone to tie the game at 7-7. KP fumbled away possession on their first drive of the second half but got it right back four plays later from a punt from Foxboro. Martinelli’s defense stood strong though and were able to get the ball back. A holding penalty backed KP up 10 yards and an incomplete pass made it 2nd and 20. Foxboro’s James Blake made his way into the backfield to sniff out a run from Garrity for a loss. On 3rd and 23, Pat Flannery came flying in on a safety blitz and dropped DeLuca for a 10 yard loss. A punt from King Philip had an unlucky bounce backwards and Foxboro took control at KP’s 29-yard line. Foxboro didn’t waste anytime as Clagg dropped back and hit senior Jason Procaccini, who was wide open after a double move created separation. Procaccini walked in untouched to put Foxboro up 14-7. With the win, Martinelli earned his 250th win to become just the 15th coach in Massachusetts high school history to reach that mark. But, unsurprisingly, Martinelli was quick to credit his players and staff. Clagg finished 10/12 for 183 yards and two touchdowns for the Warriors while McNamara (105 yards) and Ryan (57 yards) each had four receptions. 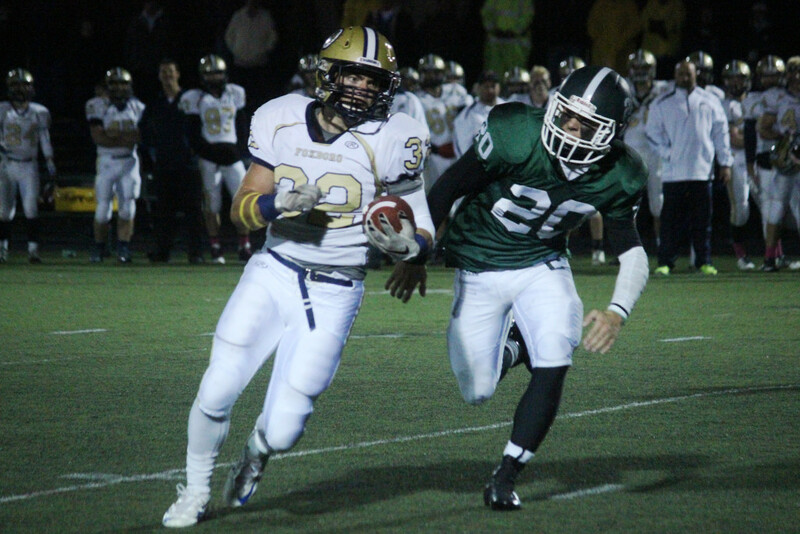 While Foxboro’s passing game worked, King Philip stuck with the running game. Gary had 109 yards on 23 carries, DeLuca had 78 yards on 17 rushes and Fernandez picked up 45 yards on seven carries. Foxboro (2-0) will open its Hockomock League Davenport Division schedule when they host Sharon next Friday. 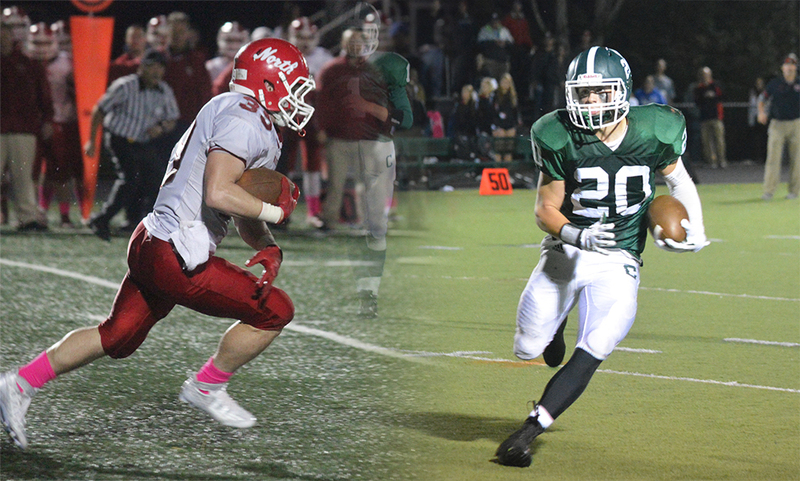 King Philip (0-2) will look for its first win when they host North Attleboro.